Were Sumas berry farm workers given enough food to eat? - PROTECT FARMWORKERS NOW! were sumas berry farm workers given enough food to eat? Were worker housing conditions as the Sumas farm degraded? Activists say Yes, photos and government inspectors say No. Did the farm cause the workers death or contribute to it in any way? Activists say Yes, in-depth government investigation said No. Did the farm not provide enough food in sufficient quality for the workers? Activists say Yes, government investigation says No. 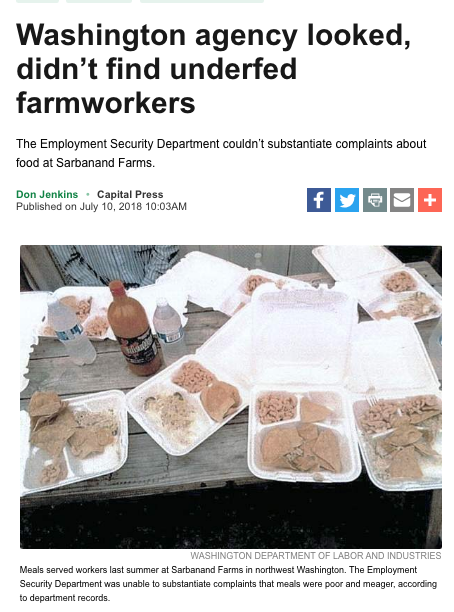 “We were unable to substantiate the concern regarding the quality or quantity of the food provided,” ESD agricultural services director Craig Carroll wrote in an email sent Aug. 7 to others in the department. Workers complained about food as investigation records find. Was this because there are always a few complainers eager to complain about anything? Or might it have been because the blue van identified as belonging to Community to Community was seen in the fields with the workers well before any complaints emerged? Might it be that the activists stimulated workers to complain and find fault with the farm even before a worker got sick? Whether the complaints were from a disgruntled few or generated by activists seeking to manipulate workers in support of their union-organizing agenda, it is now known that except for the verified issue with some late and/or missing rest breaks, the farm continues to be exonerated.